Confidence indicators follow a stronger profile in the euro zone. Households and companies have a more positive perception of their foreseeable future. 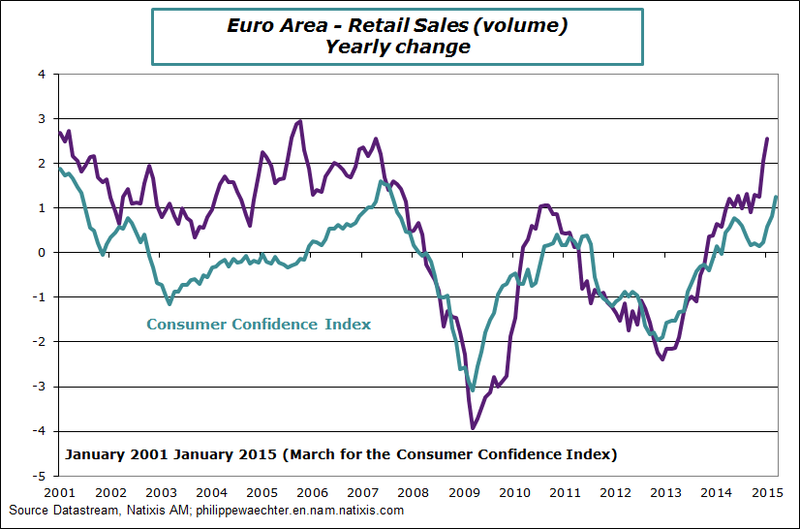 For households, confidence indicator is back, in March, to its 2007 level if we follow the European Commission survey. The situation is changing as a result of the cheaper oil, low interest rates and a more buoyant labor market (employment was up in 2014 for the Euro Area (+0.6%) This will continue in 2015. On companies’ side indices also are improving. Markit indices for March are more robust and are consistent with an increase in activity in the first quarter. The momentum in orders and employment suggest an increase in business dynamics leading to the convergence towards a virtuous circle. 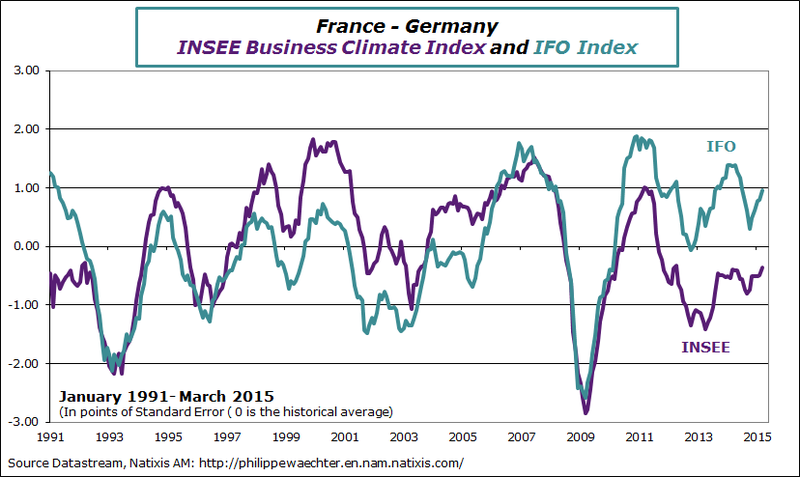 The INSEE business climate index rose slightly in March. 3-month improvement is significant, but does not reflect a violent acceleration of activity. Janet Yellen speech in San Francisco suggests that the Fed’s president wants to see higher fed funds this year. If the economy converges to the Fed’s scenario then the FOMC will have to increase rates. The argument that inflation will accelerate due to the improvement in the labor market is not completely convincing. The idea of ​​defeating inflation before it starts follows the assumption that the moment where inflation will accelerate is known in advance. Some Very Serious People point to a high probability of high inflation since 2009 and the implementation of unorthodox monetary policies, but with little success. The inflation rate is just 0.3% in February following the PCE index. The US inflation rate has registered a slight increase of 0% in February (-0.1% in CVS) and 1.7% underlying rate – Do not forget that “Shelters” in the index has a contribution of 0.95%. Other dub-indices do not change a lot. Markit and ISM surveys for the manufacturing sector will be published Wednesday. Then we will have a fuller understanding of the global economic dynamics.